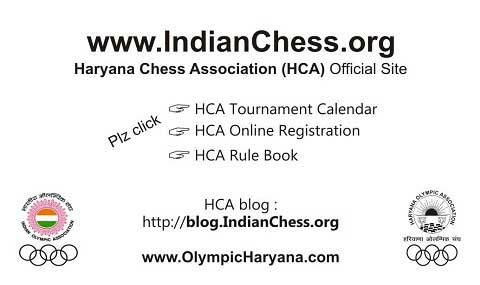 HCA Online Registration on www.IndianChess.org is compulsory. Participants are required to bring their own Pen, Note-book | HCA Chess Set. FIDE Tie Break System will be applied except Top-3 positions. Time control : a chess clock may be introduced at any stage of game. * 10 minutes each player with 3 seconds increment from move-1 in Tie Breaks. * 30 minutes each player with 1 second increment from move-1 in Rounds. Age Proof : Participants must produce a valid certificate (Birth Certificate or 10th Marks Sheet or School Leaving Certificate or other appropriate document) before HCA on demand any point of time to prove own age. Players without date of birth certificates will not be allowed to participate. * No protest about over age of a player will be entertained after 2nd round of Championship. Only participant can lodge such protests. Each player is required to record moves. In OPEN group, HCA Chess Clocks are compulsory from starting of Round-match @ all boards. Last date for HCA Online Registration is 3 days before Tournament Start Date. Any misconduct or indecent behaviour may result expulsion from HCA events. Un-official/friendly match is strictly prohibited within official playing area/place. * Sound / disturbance is equivalent / considered as Warning. 1 illegal = 2 Warnings or 3rd warning = loss of game. Entries will be accepted only within stipulated time frame, thereafter HCA have discretion to accept entries with late fee of Rs. 50 or to reject entries. Smoking, drinking and cell phones are strictly prohibited inside Venue/playing area. Interference is strictly prohibited & result produced not challengeable in any condition by third person regarding game/match/result of two players (Black & White). Participants have 100% freedom during their match. No other participant can interfere in their match/result etc. * No application/complaint will be entertained (a) after publishing of next round pairings on Notice Board or www.IndianChess.org (b) without Evidence (picture of Result Sheet). * Both players (White and Black) must take a picture of Result Sheet after write down results as Evidence. Spectators (players who have finished their games, Parents, Managers and Coaches) are not allowed inside playing area. All participants (Male + Female) must report to Secretary General HCA on starting day 9 AM or in due time @ venue of respective championship. HCA Soft copy Certificates shall be awarded thru HCA WhatsApp number " +91 98129 20931 " from 3 days after Tournament End Date﻿ only to those players who will attend Opening & Prize Distribution Ceremony and has scored > 3 points. List of Online Registered Players are available 1 day before Tournament Start Date. To download list Plz visit "LIVE Pairing & Results" page. * List of Online Registered Players are published on www.IndianChess.org in a gap of each 10 days e.g. nearby 10, 20, 30th day of each month. Bus Concession : all selected players / district position holders are entitled for 75% concession in Haryana Roadways buses regarding HCA State level Championships. To avail this concession, applicant may apply to Distt. Sports Officer of his/her area alongwith HCA letter in this regard. No protest about matter of over age and districts sharing borders of a player will be entertained after 2nd Round of Championship. * Protest/complaint regarding any matter except matter of over age and districts sharing borders shall be made in writing with a protest fee of Rs. 50/- within 10 minutes of occurrence of incident. Fee will be refunded if protest is upheld. No protest will be entertained after stipulated time frame. * OPEN group means open for all districts of Haryana. 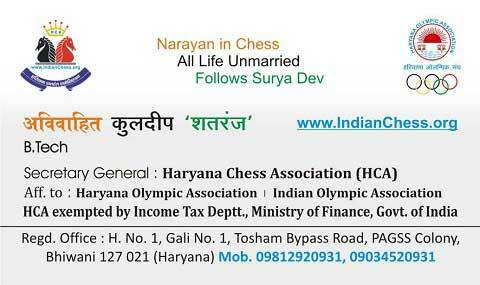 In case any other organisation other than HCA is organising a Chess tournament then players at District & State levels and different Age-groups will require an advance permission from HCA for playing/participating in such tournaments. HCA will allow only top 3 positions of concern categories at District & State levels (HCA will allow only to participate silently, NOT allowed to do Publicity of such events). None other than above mentioned will be allowed under any circumstances. Entry fee once paid will not be refunded & transfered in any condition. HCA reserve right to admit late players starting from Round-2. HCA will have right to accept or reject any entry without assigning any reason. Walk over : Any player who arrives at Chess board after 10 minutes of start of session shall lose game. Thus Walk over time is 10 minutes. Members of HCA can participate in HCA Events. Only Unmarried person will be eligible to be appointed/elected as Secretary General of HCA and will remain unmarried for whole life. Interpretation : For interpretation of HCA rules and deciding any point not covered by HCA Rule book, decision of HCA Secretary General shall be final and binding. HCA Secretary General has every right to make any additional or amendment to HCA rules, without notice. * HCA can deposit a security fee of Rs 1000 or more from a player, in writing to ensure that player will follow all HCA rules. Participants are required to bring their own Room Lock, Bed Sheet. 5 to 7 Rounds Swiss System : Time control of 30 minutes each player with 1 second increment from move 1. After 11 AM Entry will be entertained b/t 3:00-3:10 PM with Rs. 50 as late fee & loss of 1st Round. 5 Rounds Swiss System : Time control of 30 minutes each player with 1 second increment from move 1. After 10 AM Entry will be entertained b/t 1:00-1:10 PM with Rs. 50 as late fee & loss of 1st Round. Participants from districts sharing borders with host district can compete in all age-groups as per PROSPECTUS. Participants (other than districts sharing borders with host district) will compete only in OPEN group. Each team shall consist of Min. of 3 players and Max. of 5 players. Serial No. of Entry Form (Summary Sheet) is equivalent / considered as Board No. of Players. SELECTION Procedure : Total points = 5 & 4.5 in INDIVIDUAL Swiss System 5 Rounds. Laws of Chess cannot cover all possible situations that may arise during a game, nor can they regulate all administrative questions. Where cases are not precisely regulated by an Article of the Laws, it should be possible to reach a correct decision by studying analogous situations which are discussed in the Laws. Laws assume that arbiters have the necessary competence, sound judgement and absolute objectivity. Too detailed a rule might deprive the arbiter of his freedom of judgement and thus prevent him from finding the solution to a problem dictated by fairness, logic and special factors. If the player, having the move, has less than two minutes left on his clock, he may claim a draw before his flag falls. He shall summon the arbiter and may stop the clocks. If the arbiter has rejected the claim, the opponent shall be awarded two extra minutes time. The decision of the arbiter shall be final. a) The number of rounds to be played is declared beforehand. Two players shall not play each other more than once. c) A player who has received a point without playing, either through a bye or due to an opponent not appearing in time, shall not receive a bye. d) No player’s colour difference will become >+2 or <-2, except for a player having a score of 50 % or more in the last round, if this helps to avoid additional floaters. e) No player will receive the same colour three times in a row, except for a player having a score of 50% or more in the last round, if this helps to avoid additional floaters. g) The difference of the scores of two players paired against each other should be as small as possible and ideally zero. h) The pairing rules must be such transparent that the person who is in charge for the pairing can explain them. The choice of the Tiebreak System to be used in a tournament shall be decided in advance taking into account the type of the tournament (Swiss, Round Robin, Teams, etc.) and the special structure of players expected to participate in the tournament. (b) The greater number of games played with the black pieces. If all the tied players have met each other, then the sum of points from these encounters is used. 2 points for a won match where a team has scored more points than the opposing team. 1 point for a drawn match, 0 points for a lost match. (b) Game points in Team Competitions decided by match points. The tie is broken by determining the total number of points scored. The combined total of match and game points may be used. If all the tied teams have met each other, then the sum of points from these encounters is used. Note, these scores are determined in each case after the application of the rule concerning unplayed games. (a1) The Median Buchholz is the Buchholz reduced by the highest and the lowest score of the opponents. (a2) The Median Buchholz 2 is the Buchholz Score reduced by the two highest and the two lowest scores of the opponents. (b1) Sonneborn-Berger for Individual Tournaments is the sum of the scores of the opponents a player has defeated and half the scores of the players he has drawn with. (b2) Sonneborn-Berger for Team Tournaments is the score made by each opposing team multiplied by the score made against that team. Then add all these sums together. Note, the rating used is after the application of the rule concerning unplayed games. (a) The Average Rating of Opponents is the sum of the ratings of the opponents of a player divided by the number of rounds. (b) The average Rating Cut is the Average Rating of Opponents reduced by one or more of the ratings of the opponents, started from the lowest rated opponent. TPR is determined by taking the average rating of the opponents. Where a player has elected not to play more than two games in a tournament, whether as a half point bye or due to ill-health, his TPR shall be considered lower than that of any player who has completed the schedule. The arbiter shall see that Laws of Chess are strictly observed. It is forbidden to write the moves in advance. If a player has less than five minutes left on his clock at some stage in a period and does not have additional time of 30 seconds or more added with each move, then for the remainder of the period he is not obliged to meet the requirements of recording moves. Immediately after one flag has fallen the player must update his scoresheet completely before moving a piece on the chessboard. At the conclusion of the game both players shall sign both scoresheets, indicating the result of the game. Even if incorrect, this result shall stand, unless the arbiter decides otherwise. The game is drawn when a position is reached from which a checkmate cannot occur by any possible series of legal moves. This immediately ends the game, provided that the move producing this position was legal. 1. For the purpose of complying with the age-limit of a junior or youth competition, the age of the participant shall be based on the year in which he was born. 2. The year specifying the age limit is calculated by subtracting the age limit of the competition from the year in which the competition is held. In a competition for Under 20 held in 2008 the participant must have been born on or after 1st January 1988. There is a single time control for all major FIDE events: 90 minutes for the first 40 moves followed by 30 minutes for the rest of the game with an addition of 30 seconds per move starting from move one. Swiss Pairing System is designed to maximize the fair treatment of the players. This means that players having the same score should have met as equal opposition as possible during a tournament. If the Sonnenborn-Berger and/or Buchholz and/or Median, of all players in the same score-group, is nearly equal, the goal is reached. As a Swiss System is a more or less statistical system, this goal can only be reached approximately. The approach is the attempt to equalize the strengh of the opponents of all players in a given score group. Therefore the pairing of each round will tend to pair players who have high Sonnenborn-Berger (or Buchholz or Median) with players having low Sonnenborn Berger (or Bucchholz or Median) in the same score-group. The ratings of the players should be taken into consideration only when the Sonnenborn-Berger (or Buchholz or Median) is equal (e.g. in the first two rounds); otherwise, only current data of the tournament itself should be the basis for measuring the "strength" of the players and making the pairings thereafter. A player who has already received a point without playing shall not receive a bye. The player from the lowest SG, who has the lowest SB, will get the bye. If there are players with the same lowest SB in the lowest SG, then the player with the lowest Buchholz will get the bye and so on. The bye has no color. In the first round the color assigned to player No.1 shall be decided by drawing a lot. All other odd numbered players in the top half of the initial list shall receive the same color. A player shall not have the same color three times in a row. In each SG priority shall be given to pair the highest player (i.e. the player with the highest SB) with the lowest player in that SG that he has not already played. The second highest player shall be paired with the second lowest player etc. The eight vertical columns of squares are called ‘files’. The eight horizontal rows of squares are called ‘ranks’. Provided that he first expresses his intention (for example by saying “I adjust”), the player having the move may adjust one or more pieces on their squares. The game may be drawn if each player has made at least the last 50 consecutive moves without the movement of any pawn and without any capture. if a player does not complete the prescribed number of moves in the allotted time, the game is lost by the player. However, the game is drawn, if the position is such that the opponent cannot checkmate the player’s king by any possible series of legal moves. If during a game it is found that the chessboard has been placed wrong, the game continues but the position reached must be transferred to a correctly placed chessboard. 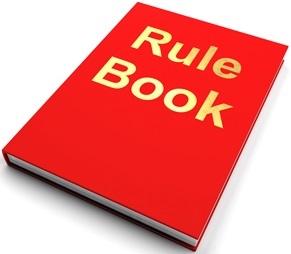 If during a game it is found that an illegal move, for the first illegal move by a player the arbiter shall give two minutes extra time to his opponent; for 2nd illegal move by the same player, the arbiter shall declare the game lost by this player. However, the game is drawn if the position is such that the opponent cannot checkmate the player’s king by any possible series of legal moves. Without the permission of the arbiter, a player is forbidden to have a mobile phone or other electronic means of communication in the playing venue, unless they are completely switched off. If any such device produces a sound, the player shall lose the game. The opponent shall win. However, if the opponent cannot win the game by any series of legal moves, his score shall be a draw.